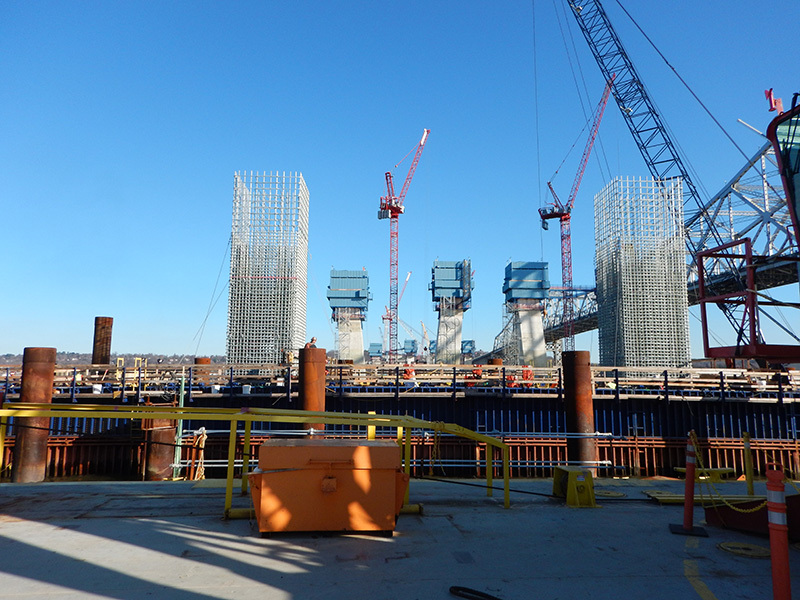 Project: The New NY Bridge – GPI | Greenman-Pedersen, Inc.
GPI as part of the team for the Tappan Zee Bridge Replacement project, is providing independent quality assurance services for design and construction. This $3.14 billion bridge replacement project involves a signature three-mile crossing over the Hudson River that when complete will be the widest bridge of that length in the world. The Design Build consortium of Tappan Zee Constructors, includes Fluor Enterprises, American Bridge Co., Granite Construction Northeast and Traylor Bros. HDR, headquartered in Omaha, NE is the lead designer. The Tappan Zee Constructors plan addresses major concerns of the aging bridge that had a high accident rate, lengthy traffic jams and complete lack of mass transit capability. Key features include: Twin spans with a total of eight general traffic lanes, plus emergency lanes and extra-wide shoulders for immediate bus service when opened; Unique towers that tilt outward for additional strength and also eliminate the need for cross beams; A first-ever dedicated bicycle and pedestrian path with safe, scenic spots and cultural information about the region’s heritage, as well as capability for bus rapid transit, light rail or commuter rail; and a new night light display with potentially changing patterns. As the independent quality assurance engineer for design and construction, GPI is responsible for providing a quality review of the work being performed, and overseeing and/or performing quality audits of the Design-Builder’s management, design and construction activities, the Design-Builder’s Quality Control procedures, Verification Sampling and Testing and the quality of the final product, utilizing ISO 9001 standards.